When the App Store first launched, one of the first kinds of apps that seemed to make sense was musical instruments. Playing piano Practice Piano Scores The Fun Way With Synthesia And Your Keyboard Practice Piano Scores The Fun Way With Synthesia And Your Keyboard Computer-aided learning, although not always a substitute for a music teacher, gives you the feedback you wouldn't get from a plain old piano book. Moreover, gamification can make practice easier, and a lot more fun... Read More and strumming a guitar on a touch screen just seemed like a natural thing to do. Most of those apps in those days were lacking on features and functionality, and we’ve certainly come a long way in terms of quality of apps on the App Store. That said, there are still some fantastic music apps out there, and Echo Piano is a great example of an app to play the piano done right. With Echo Piano you get all the features you could need for playing music on your iPhone. It is simple to use, and it has some cool features that will help people who have never even played the piano figure out how to use it and make some cool music. Best of all, you can grab Echo Piano on the App Store free for a limited time. The App comes with a regular price of $0.99, so you can save yourself a little cash while making some cool music with the piano. The feature that makes this app stand out among the competition is the fact that you can quickly scroll the keyboard to different octaves without stopping the flow of music. You can simply swipe the screen to the left or right to move along the keyboard. You can also tap the image of the piano above the play field to jump to a certain spot. This creates a more authentic experience, even if you are still using the small iPhone screen. The app comes with a record function, so you can keep your musical creations. To record, simply tap the red button on the top left of the screen and begin playing your music. Once you finish, you can save your music and share it with friends through email. You can send the songs in MIDI formats, so your friends can hear your creations in almost any music player. The app comes with the notes written right on the keys. This is incredibly helpful if you are just learning to play the piano. Having the notes right on the keys makes it easy to identify them and get to making your music faster. The app also comes with a bunch of songs that you can play along with. To get access to these, you tap the file cabinet button on the top of the screen. This is also where you will come to see your own saved songs once you have created your own masterpieces. The app also has a lock button, which resides next to the file button. Pressing this will make it so you cannot scroll through the keyboard, which will prevent you from accidentally sliding if you only want to play in one spot. Generally, you will want to move around, but if you don’t, this comes in handy. The settings screen of Echo Piano offers you the ability to turn off the note labels on the keys and adjusting how long the sustain is on for. It also offers tips and tricks for using the app and recoding songs. 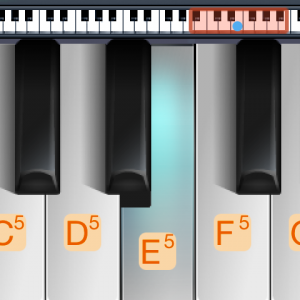 This is easily one of the best piano applications available on the App Store. It comes with all the features you need whether you are an experienced pianist or a newbie just learning to play. Best of all, you can grab it free from the App Store for a limited time. Don’t wait, because the price will go up before you know it! Limited time free was correct, went to $4.99 on the 4th. Good review though, I was going to give it a try.